Many compatible cartridges will look different to the original versions, as they are made in a different factory with different moulds. If the numeric component of the part number matches up though, they will still fit. There are a couple of things to be aware of. 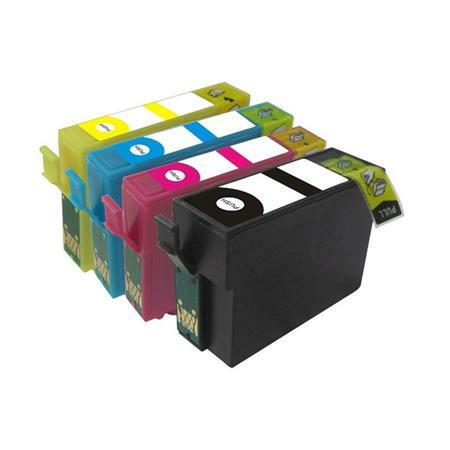 Some suppliers ship these cartridges with a protective spacer between the body of the cartridge and the clip that holds it in place in the printer. This is marked below. This needs to be removed before the cartridge is inserted, or it will not fit, and if forced into place can be difficult to take out. There are some models of cartridge that are double the width of the usual size. If you look at the picture below you will see that the black cartridge is much larger than the colour versions. This is because on some models of Epson printer there is space for the black cartridge to overhang the carriage, so some manufacturers take advantage of this free space to increase the size of the cartridge and the amount of ink in it. Once again, if the numeric component of the part number is correct for your printer (if for example you were expecting a T1301 and received a PI-1301) then it is the right cartridge, and will fit.